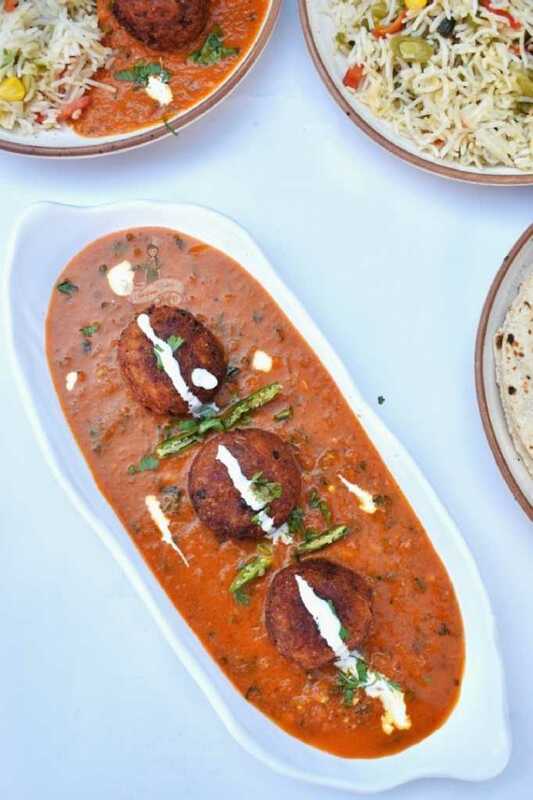 Cauliflower Paneer Kofta is a mildly spiced curry made of grated cauliflower and cottage cheese. 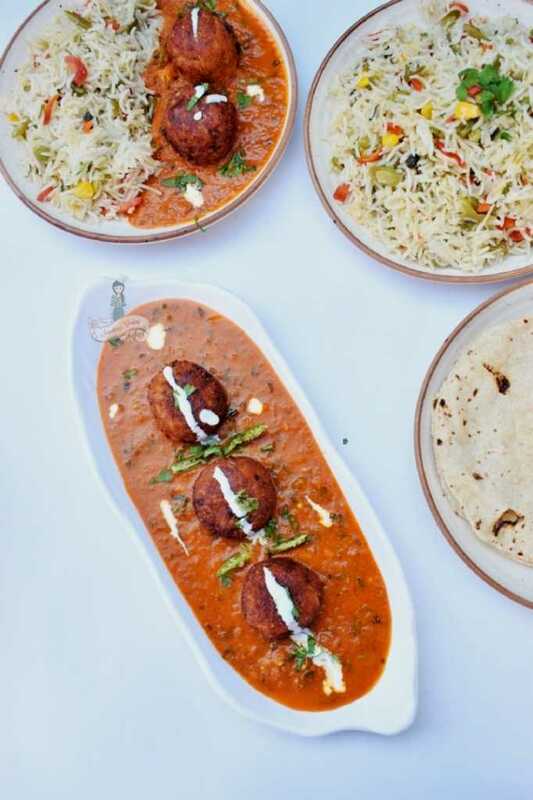 This delectable dish has a silky smooth gravy and melt-in-the-mouth kofta balls, together making it one of the best Kofta curries you can prepare at home. Serve as a side dish to rice and rotis. I love Kofta. Kofta Curries is one of the first dishes I’ve ever prepared in my life. And now, they are the most popular and regular dishes at home. Of course, I try to bring about a change or a twist every time and the husband always fails to identify the ingredients of the Koftas. That’s a good thing, y’know. I can play around with the vegetables. A Kofta is a fritter in the shape of a ball. Traditionally, a kofta is made of minced meat. In India, we make koftas with different kinds of vegetables. Hailing from the South of India, I wasn’t familiar with Kofta curries. One day, which was some day soon after the wedding, I found a Cabbage lying around in the refrigerator. All I could think of was making Cabbage Thoran. However, I was kinda fed up with this regular everyday dish and that was when I decided to try out a Kofta recipe from one of the many handmade cookbooks gifted by Mom; handmade because she used to collect recipes from different magazines and made about five humongous ledger books. Anyway, from this first trial of making Kofta on, there was no looking back. Today we would be preparing Cauliflower Paneer Kofta which is a little time-consuming compared to the other Kofta curries that I try at home. Nevertheless, you will know that it is worth the effort. The curry is simply exotic. 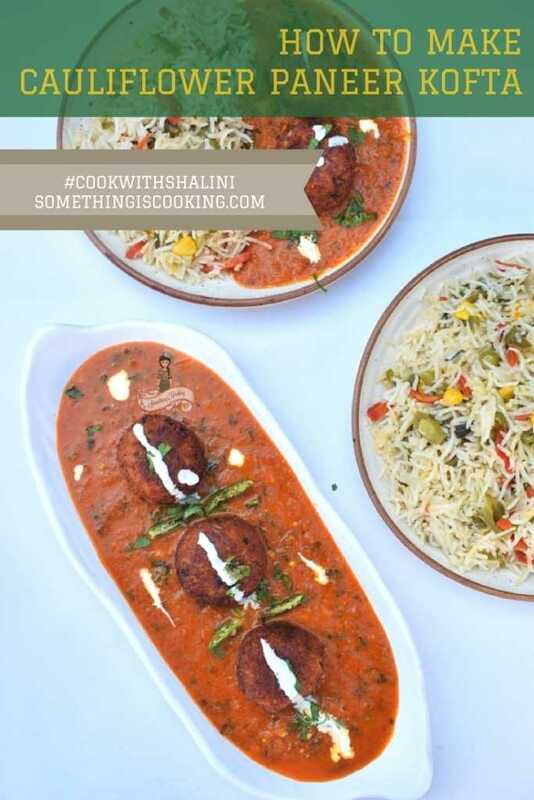 A couple of days ago, a dear friend of mine, a wonderful blogger – Ramya Abhinand from Me Otherwise asked me for a Kofta recipe. When I mentioned that I love preparing different varieties of Koftas, she asked if she can find it on my blog. That was when I realized that I don’t have even a single one in this space. Truly unfortunate, I should say! That said, if you find many Kofta recipes coming up on the blog in the coming days, you know why. 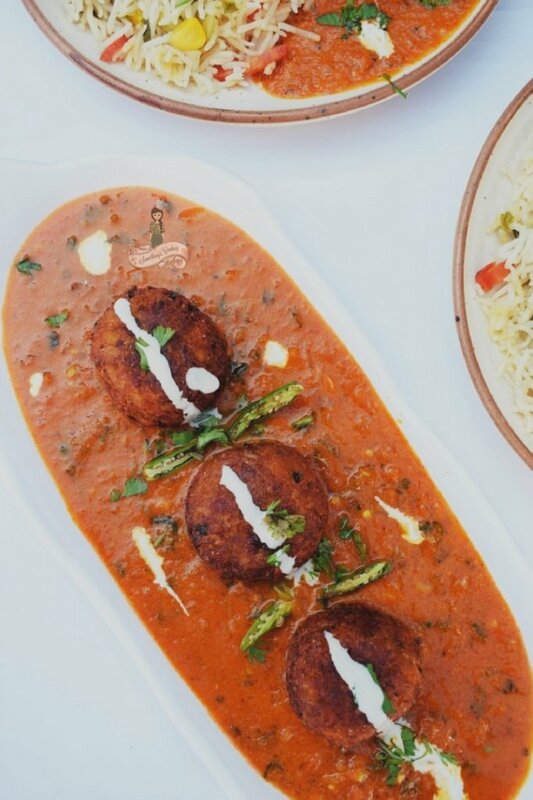 Like any other Kofta curry, Cauliflower Paneer Kofta too has the same onion-tomato base. However, the tender and soft koftas make this dish irresistible. Grate boiled cauliflower and squeeze out the excess water. Add grated paneer, mashed boiled potatoes, spice powders and corn flour. Mix and bind together to make small balls. Deep fry them to a golden color. To prepare the base cook finely chopped onion and tomato puree in little oil or butter. Add the spice powders and a cup of water and cook until you get the desired consistency. Put in a spoonful of fresh cream and mix well. Add fried kofta balls and serve hot with rice or rotis. Boil cauliflower with little salt in water for about five minutes. Remove from hot water and pat dry. Grate the cauliflower and squeeze out the water. To remove the excess water, you can now pan roast the grated cauliflower for a couple of minutes. Do not brown, we are doing this step to remove any excess moisture that is present. Remove and let it cool down. To this, add grated paneer and boiled mashed potatoes. Add the spice powders, corn flour and salt. Mix well. Make balls for kofta and deep fry in oil. Remove and keep aside. Heat oil or butter in a pan and add cumin seeds. When it splutters, add finely chopped onions. Saute until cooked. Add tomato puree and mix well. Cook in medium low flame as the tomato tends to dance when cooked in high heat. Let the mixture thicken. Add the spice powders and mix. Saute until you see oil releasing from the sides of the pan. Add water and salt and cook until you get the desired consistency. Add fresh cream and give it a quick stir. Remove from flame. Add the koftas just before serving. This will ensure that the koftas remain intact, crisp on the outside and soft on the inside. Garnish with coriander leaves and fresh cream. Pan roast the grated cauliflower after squeezing out excess water. Do not omit this step. It will ensure that the cauliflower remains dry and the koftas will bind well and will not break while frying. Adding koftas to the gravy just before serving will ensure that the kofta balls remain intact and not gooey. Like this recipe? You should definitely try it out or pin it for later use. Here are other recipes made using Paneer. An elaborate affair but going by the pics, it appears worth its efforts. Tempted me to give it a try Shalini! Aha! The much awaited recipe from your kitchen is finally out! Will be definitelyvteying this out. This is a fab dish made from regular ingredients easily available in my fridge so I have to try this! The pics are tempting me to try this asap! Will definitely try this out !